Like many people, I was glued to social media on the night of November 13th as the terrorist attacks on Paris unfolded. When something terrible like that happens, it is easy to become confused and bewildered by the conflicting reports that fly around on TV and online. So I decided to write a guide to understanding and demystifying the kinds of sources (newspaper articles, TV and radio reports, live blogs, social media posts, visual images etc.) that you will encounter in all forms of the media when a major news story is breaking. But what qualifies me to write such a guide? Who wrote/produced/directed/photographed/filmed this source? Are they a professional journalist/photographer/film-maker? Or are they a member of the public who happened to be there at the time and snapped a photo or filmed events with their phone then posted it on Facebook? If they’re a professional, what do you know about them? What can you find out about them? Are they well-known for personally having a particular political bias? Or do they work for a media outlet known for having a particular political bias? How might this affect their work? You may have also noticed that the blog now looks very different. After using and liking this new theme on the Top Fifty Nineties Album blog, I decided it was time for a change here as well. Personally, I think the new look is much better, and I hope you do too – plus this particular theme is configured to show properly on both computers and mobile devices, so you can also now read Another Kind Of Mind on your tablet or phone if you so desire! On the subject of the Top Fifty Nineties Albums blog, my list is now complete. If you missed out on my reviews, you can still find them all there, along with a few geeky stats and links to loads of other great lists sent to me by various Twitter people. I’ll be adding more lists and other bits and pieces as time goes on, so keep an eye out for that if you’re a music fan. Elsewhere, street art fans will want to check out my Flickr stream, which I’m regularly updating with lots of interesting images from various sites in and around London. You’re also welcome to follow me on Twitter (where I mostly ramble rubbish and/or talk about music), or over on Tumblr (where Another Kind Of Mind’s slightly eccentric and distinctly vintage photography-obsessed little sister blog lives). And I’ve got some good stuff coming up for you right here (alongside quite a few long-promised and much-delayed posts! ), including more sideways glimpses into the history of my favourite city, another musical memorial bench, how to be a telly ‘tec, and a few other bits I probably haven’t thought of yet. Plus, Another Kind Of Mind will be celebrating its fourth birthday at the end of this month, believe it or not – so I’ll also have to think up a way to mark that surprising anniversary! Finally, I’ve had a few responses to my call-out for mondegreens, but I still want more! We’ve all misheard a lyric or two whilst listening to music and I want to hear your favourites – leave a comment or tweet me your contributions, and the best will be included in an upcoming post. Just a quick post to let you know that as of today, I have mothballed the Another Kind Of Mind Facebook page. Sadly, the stats are telling me that it is hardly reaching anyone and that this situation is only going to get worse now that new rules for pages have been introduced by Facebook. The page will continue to exist but it will no longer be updated. If you were one of the few that the Facebook page was reaching and you wish to continue being updated about new material on Another Kind Of Mind, please subscribe to the blog directly (you can find the details at the very bottom right of this page), or follow me on Twitter. Incidentally, I have removed as many references to the Facebook page as I can find – but with more than 250 posts on here, trawling through them all will take some time! If you do spot any that I have missed, please leave a link to the relevant post in the comments here or on the Feedback page. Thank you to all the people who liked, commented on and shared the page – I am sorry to see it go, but it is no longer worth my while to continue updating it, especially as I am using Facebook less and less in a personal capacity. There are some brand new Christmas blog posts coming soon! I will also be speculating about the end of the world (or not) and – assuming we’re all still here by December 31st, obviously! – exploring New Year’s celebrations through history. Watch out for those in the next few weeks – but if you can’t wait until then, you can find some of my previous seasonal posts here. These filing cards have now formed the basis of The John Peel Project on The Space, an Arts Council-funded pop-up website, which launches this month and runs until the end of October. Every week, for the next 26 weeks, users will be able to browse the first 100 cards from each letter of the alphabet, with one album pulled out for special attention. “We will try to get a film of the artist, show old clips of them, look into what they are doing now,” says Ravenscroft. Unsurprisingly for a British-based blog, the vast majority of my readers during that period hail from the United Kingdom, with the United States and Canada lagging a long way behind in second and third. I also seem to get a lot of European visitors – in fact, during the period covered by the stats, readers from twenty one of the twenty seven European Union member states popped by (I’m only missing hits from Cyprus, Estonia, Luxembourg, Malta, Slovakia and Slovenia, so if you know anyone in any of those countries, send them a link to Another Kind Of Mind NOW!). But I also get hits from some slightly more exotic, far-flung and, frankly, often unexpected places, including Argentina, Mexico, the Netherland Antilles (where’s that? ), Bermuda, Mongolia (wow), Paraguay, Vietnam, Morocco, Japan, Tunisia, Egypt, United Arab Emirates, Qatar, Korea, the Philippines, Australia and New Zealand. I’d had no idea that Another Kind Of Mind had such an international reach – thank you to all of you, wherever you are, for your visits! ‘The Crisis of Civilization’: Out now on DVD and online!! After many requests from fans of the film and much hard work from the Crisis Team, it’s finally here… Yes, The Crisis of Civilization has, at long last, been unleashed online and on DVD! Remember, if you decide to buy the DVD, you can be safe in the knowledge that in doing so you are helping to support the project (which has been created on a shoestring by a small and dedicated group of people volunteering their time, skills and energy) in the important job of getting the film out to as many people as possible. So tell your friends and share the links. Everyone should see this film! Watch it. Download it. Buy it. Screen it. Share it. ‘The Crisis of Civilization’: Out on DVD and online 14th March! Really exciting news reaches me from Crisis of Civilization HQ – from March 14th 2012 at 7pm UK time, everyone will be able to watch and download the film online for FREE, as well as being able to buy the DVD from the Crisis website or from Amazon! The DVD will be available in both PAL and NTSC formats – which means that anyone can put a screening on now, wherever they are in the world – and comes in lovely eco-friendly recycled packaging (of course!) with over an hour’s worth of extra goodies for you to enjoy, including deleted scenes, remix films, and additional interview footage. You’ll also find a range of subtitles in English, Spanish, Portuguese, French, German, Swedish and Chinese, which have been expertly put together by an amazingly dedicated bunch of linguistically talented volunteers. There’s been lots of interest in the release already, with reviews from the Transition Voice website and the independent film magazine Little White Lies, as well as a great response from the BAFTA-winning film-maker, Nick Broomfield, who described The Crisis of Civilization as “a unique film. Everyone should see it”. I know my readers love a challenge – and here’s a really exciting one from The Crisis of Civilization team! 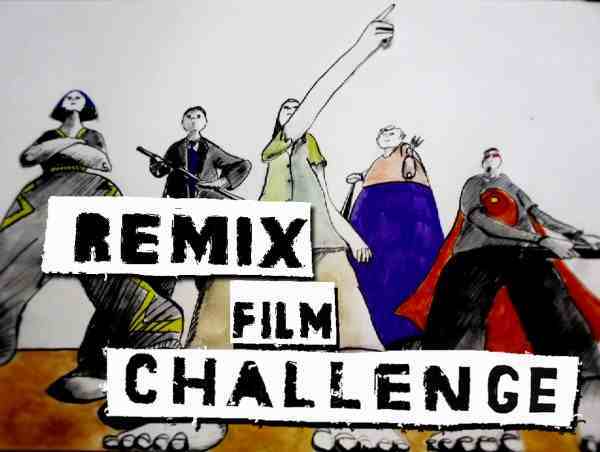 If you’re into film-making, you’re invited to take part in their Remix Film Challenge. Using audio, archive film footage and music, you too can make your very own Crisis-style sequence – and be in with a chance of winning an A1 poster and a DVD of The Crisis of Civilization (released in March 2012) in the process. Detailed instructions on exactly how you can get involved, along with lots of links to download the audio files and to find archive footage – as well as other links to some useful editing software – can be found here. You can also find out more about the archive film footage used in The Crisis of Civilization and watch some of the team’s favourite moments from the archives here. Spread the word – tell your friends and start Remixing!